Nevertheless, if any one should ask of me how comes it that the Church has attained such greatness in temporal power, seeing that from Alexander VI backwards the Italian potentates (not only those who have been called potentates, but every baron and lord, though the smallest) have valued the temporal power very slightly—yet now a king of France trembles before it, and it has been able to drive him from Italy, and to ruin the Venetians -although this may be very manifest, it does not appear to me superfluous to recall it in some measure to memory. Before Charles VIII, King of France, passed into Italy, this country was under the dominion of the Pope, the Venetians, the King of Naples, the Duke of Milan, and the Florentines. These potentates had two principal anxieties: the one, that no foreigner should enter Italy under arms; the other, that none of themselves should seize more territory. Those about whom there was the most anxiety were the Pope and the Venetians. To restrain the Venetians the union of all the others was necessary, as it was for the defense of Ferrara; and to keep down the Pope they made use of the barons of Rome, who, being divided into two factions, Orsini and Colonnesi, had always a pretext for disorder, and, standing with arms in their hands under the eyes of the Pontiff, kept the pontificate weak and powerless. And although there might arise sometimes a courageous pope, such as Sixtus IV, yet neither fortune nor wisdom could rid him of these annoyances. And the short life of a pope is also a cause of weakness; for in the ten years, which is the average life of a pope, he can with difficulty lower one of the factions; and if, so to speak, one people should almost destroy the Colonnesi, another would arise hostile to the Orsini, who would support their opponents, and yet would not have time to ruin the Orsini. This was the reason why the temporal powers of the pope were little esteemed in Italy. Alexander VI arose afterwards, who of all the pontiffs that have ever been showed how a pope with both money and arms was able to prevail; and through the instrumentality of the Duke Valentino, and by reason of the entry of the French, he brought about all those things which I have discussed above in the actions of the duke. And although his intention was not to aggrandize the Church, but the duke, nevertheless, what he did contributed to the greatness of the Church, which, after his death and the ruin of the duke, became the heir to all his labors. Pope Julius II came afterwards and found the Church strong, possessing all the Romagna, the barons of Rome reduced to impotence, and, through the chastisements of Alexander, the factions wiped out; he also found the way open to accumulate money in a manner such as had never been practiced before Alexander's time. Such things Julius not only followed, but improved upon, and he intended to gain Bologna, to ruin the Venetians, and to drive the French out of Italy. All of these enterprises prospered with him, and so much the more to his credit, inasmuch as he did everything to strengthen the Church and not any private person. He kept also the Orsini and Colonnesi factions within the bounds in which he found them; and although there was among them some mind to make disturbance, nevertheless he held two things firm: the one, the greatness of the Church, with which he terrified them; and the other, not allowing them to have their own cardinals, who caused the disorders among them. For whenever these factions have their cardinals they do not remain quiet for long, because cardinals foster the factions in Rome and out of it, and the barons are compelled to support them, and thus from the ambitions of prelates arise disorders and tumults among the barons. For these reasons his Holiness Pope Leo X found the pontificate most powerful, and it is to be hoped that, if others made it great in arms, he will make it still greater and more venerated by his goodness and infinite other virtues. Pope Leo X (formerly Giovanni di Lorenzo de' Medici) was the uncle of Lorenzo di Piero de’ Medici to whom Machiavelli dedicated The Prince. Machiavelli is telling Lorenzo that Leo is more powerful than Pope Alexander VI. Therefore, if Lorenzo were to take on the role of Alexander’s son Cesare, he is likely to succeed where Cesare failed. Pope Julius II (Giuliano della Rovere) as a fledgling cardinal (left), with his uncle Francesco della Rovere, then Pope Sixtus IV (right). Attribution: Melozzo da Forlì [Public domain or Public domain], via Wikimedia Commons. This is the last chapter where Machiavelli discusses the various strategies for holding power given the means by which the prince came to power. The chapter title “Concerning Ecclesiastical Principalities” (plural), may strike us as a bit odd because there seems to be only one, the papacy. However, we will see in Chapter 19 that he also considers the Sultanate of Egypt another example. The key issue is the mode of succession. That is, with respect to the way in which the prince acquires it, the principality is neither hereditary nor new (mixed or entirely new). When Machiavelli refers to the period before Charles VIII invaded Italy, he is talking about the status quo that had prevailed in Italy since the War of the Milanese Succession 1454. That war pitted Milan against Venice during which Francesco Sforza usurped the principality. 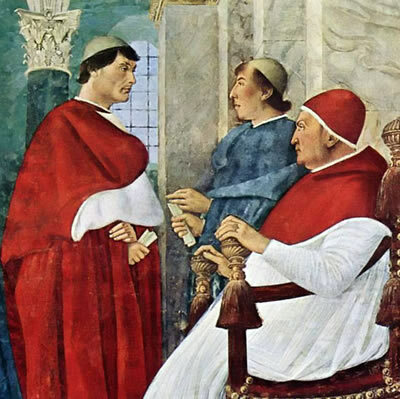 As noted in connection with Chapter 7, Italian popes since Sixtus IV sought to regain full control of their property in the Papal States, which had been largely usurped by warlord princes. Alexander VI, financed the wars of his son, Cesar Borgia, in the Romagna to the same end. After the death of Alexander and Cesare, Venice moved in on the Romagna towns. Pope Julius II continue the re-conquest of the Romagna, this time initiating the League of Cambri War with France against Venice. Later he would switch sides and form the Holy League with Venice to oust the French from Italy.